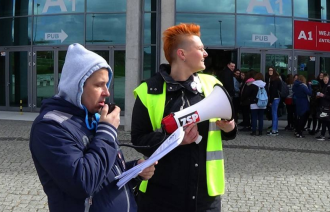 On April 26, members of ZSP picketed at the Festival of Educational Innovation in Gdansk, organized by the JMP Foundation. The union has conducted a number of actions against JMP and its founder, Magdalena Majorczyk after a number of workers informed of wage theft practices. Although we were eventually able to get payment last year, other workers contact us about problems with getting paid. Due to the fact that these problems continue, so will the protests. The event was attended by a few stars and hundreds of school children, whose schools organized outings. After discussions with some teachers who alleged that they were forced to collect money from students and take them to this event, we really wonder what this is all about and how these people fund such grand events but cannot seem to pay people for their labor.